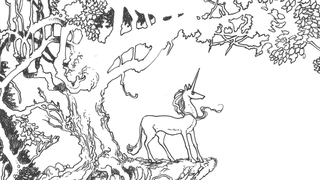 Hey O’Deckers: If you’ve got nothing else better to do on this pre-Thanksgiving Sunday, read this fantastic Atlantic Monthly essay by Yosef Lindell on Peter S. Beagle’s magisterial fantasy classic The Last Unicorn, now fifty years old. It’s a perceptive take on Beagle’s novel, observing that it’s a type of fantasy that gets by almost entirely without worldbuilding, relying instead on allusion and mood — not an “epic fantasy,” like Tolkien or Martin, but “applied fantasy,” building on the readers’ own understanding of reality and personal experience. The essay is so good, it’ll make you want to reread Beagle’s novel. And if you’ve never read it, you’ll want to, even if you’re not into the whole unicorn thing.